Edited by Alain Roques, et al. that have colonized the European continent and its associated islands. Directly ensuing from the DAISIE project, this is the result of the joint work of 89 authors from 27 different European countries. These two volumes summarize present knowledge of the arthropod invasion process, from temporal trends and biogeographic patterns, to pathways and vectors, invaded habitats, and ecological and economical impacts. 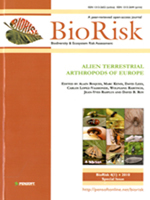 A total of 1590 species alien to Europe, including crustaceans, myriapods, mites, spiders, and insects, are listed in two volumes and 21 seperate chapters that detail the different taxonomic groups.